Prof. Barry Merkin's class brings Kellogg students face to face with venture capitalists for a taste of real-world entrepreneurship. 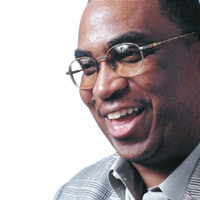 Kellogg Prof. Steven Rogers, one of the country's foremost entrepreneurship scholars. Kellogg School Finance Professor Steven Rogers begins every introductory class of his popular Entrepreneurial Finance course with the same question: "How many of you would like to become an entrepreneur someday?" Inevitably, hands shoot up to fill the crowded lecture hall. But although an overwhelming majority of Kellogg School students — and Americans in general — express the desire to be their own boss eventually, few have developed the "big idea" that paves the way to a successful entrepreneurial venture. Rogers, the Gordon and Llura Gund Family Professor of Entrepreneurship and one of Kellogg's best-subscribed professors, has a message for those students and others: The world of entrepreneurism is not so narrowly defined. Entrepreneurs are not only those who tap their inner stores of passion, creativity, resolve and grit to start a business from nothing, but those who draw on the same reserves to buy and run existing companies or build franchise businesses. All three endeavors require the ability to do something Rogers calls "execute" — to manage cash, people and projects. All three also require a winning business plan, the ability to adapt to market conditions and to look continually for opportunities. Kellogg School Dean Dipak C. Jain, who is the Sandy and Morton Goldman Professor of Entrepreneurial Studies, further points out that entrepreneurship isn't limited to small businesses or start-ups. Even large, well-established corporations rely on an entrepreneurial spirit among employees to initiate new ventures. "Today, the entrepreneurial approach is vital for many kinds of firms," says Jain. "Despite the organizational dynamics that differentiate a large company from a smaller one, agile companies are those best able to respond to and capitalize on market shifts. Typically, the agile firm is one that embraces entrepreneurship to leverage the entrepreneur's passion and creativity." The reaction from most Kellogg students who hear these messages is one of relief. "Many of them come here with the idea that the only way they can be an entrepreneur is to build a business from scratch. We let them know that entrepreneurship is much broader than that," explains Rogers. As proof, he offers two enormously successful entrepreneurs: H. Wayne Huizenga, who began the Blockbuster empire by acquiring local video stores, and Howard Schultz, who transformed a handful of Seattle-area coffee shops owned by four others into Starbucks Corp.
"A person never has to feel burdened by finding an idea. Sometimes you're just better at taking someone else's idea and developing it," says Rogers, whose introduction to entrepreneurship was as a child, working in his family's used-furniture stores and selling goods at flea markets. As an adult, he's bought and sold three successful lamp-shade companies and earned a long list of entrepreneurial honors that includes being named one of BusinessWeek's 12 best entrepreneurship teachers and one of Fortune's top 10 entrepreneurial thinkers. For those who envision an independent venture in their future, there is perhaps no better place than the Kellogg School and its Heizer Center for Entrepreneurial Studies, Dean Jain says, since its culture of constant, though calculated, change represents the very heart of entrepreneurism. "Kellogg by definition is a very entrepreneurial school," Jain says. "One of the most significant differentiating characteristics of Kellogg is our commitment to continuous change and innovation. And our special strength is speed of execution." Indeed, the Kellogg School's existing curriculum takes the prospective entrepreneur through the entire life cycle of a business — from how to get started and then grow an enterprise, to how to develop early stage capital and find additional capital. Kellogg boasts one of the largest selections of entrepreneurial courses of any business school in the United States, as measured by the Ewing Marion Kauffman Foundation, and teaches both the theory and practice of entrepreneurship. Students select from a list of courses that includes Women and Entrepreneurship, Venture Capital and Private Equity Investment and Entrepreneurial Leadership. New courses, such as Family Enterprises: Issues and Solutions and Business Law have continued to add to the program strengths. Few other majors effectively bring together so many different areas of study. Becoming a successful entrepreneur requires solid financial and marketing skills and the ability to write and execute a business plan, as well as the leadership and personal traits to motivate others. 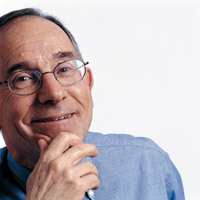 Morton I. Kamien, the Joseph and Carole Levy Distinguished Professor of Entrepreneurship and director of the Heizer Center for Entrepreneurial Studies, says it is imperative that students who choose the school's entrepreneurship and innovation major soak up skills from all of Kellogg's departments. The Kellogg School's curriculum strengths in other areas are a distinct benefit to budding entrepreneurs, he points out. "The Heizer Center for Entrepreneurial Studies is in the midst of the No. 1 business school," Kamien says. "It builds on the excellence of research and teaching in all of these other areas." Jain and other Kellogg professors see a world of opportunity for MBA graduates who pursue jobs with small businesses, family businesses and start-ups. They point to statistics such as those published by the National Commission on Entrepreneurship that reveal how, since 1980, small businesses have added 34 million new jobs, while Fortune 500 companies have shed 5 million jobs. "The job creation throughout America and throughout the world is fueled largely by entrepreneurial ventures, not the Fortune 500 companies," Rogers says, reprising a point raised in his 2002 book The Entrepreneur's Guide to Finance and Business. John Tomaszewski '98, for example, is building a company called NaviAsia Consulting Group Inc., which helps firms enter the China market by leveraging supply chain and sales and marketing expertise. "I've learned so much and I think Kellogg provides an excellent foundation," Tomaszewski says. "Starting your own business takes so many different skills — from working with diverse groups of people, to setting up a payment structure, to understanding the motivation of people who want to buy your services." Tomaszewski, president of the Kellogg Alumni Club of Chicago, also is part of a Kellogg alumni effort to volunteer services to fledgling firms associated with Northwestern University's business incubator. So far, more than 60 alums have volunteered to advise on such issues as marketing strategy, patent law and fund raising. Kamien says it was rocky economic times and the corresponding need to create their own job opportunities that prompted MBA students in the 1980s to demand more course offerings in entrepreneurship, once a mostly overlooked topic of study at business schools. "Students became interested in entrepreneurship more out of desperation than out of inspiration," he says. "Giant corporations began to sway in the wind, and people began losing their jobs at companies they thought they were lifers for." Conversely, the heady dot-com days introduced a variety of entrepreneur sometimes fueled by inspiration and little else, including strategic or operational insight. Today's successful entrepreneur, Kamien says, is both inspired and realistic about the challenges presented by a changing marketplace. Graduates, he predicts, will seek opportunities in traditional bread-and-butter industries, as well as those that have yet to capitalize fully on modern technology. Examples include the funeral industry and automobile dealerships — sectors that are still trying to compete financially, and aren't necessarily glamorous. Kellogg School alum Pat Ryan Jr. '97 is finding his opportunity with franchise automobile dealerships, an industry he says has been slow to incorporate the use of business intelligence software. First Look, the business he founded in 2001 with fellow Kellogg alum Dave Jacobs TMP '98, is an attempt to bring some of the analytical sophistication of the airline and credit card businesses to the world of franchise automobile dealerships. First Look markets software that uses simple outputs to provide the benefits of complex analysis to large automobile dealers, allowing them, among other things, a more precise way to value trade-ins. After entering a vehicle's identification number, the software uses valuation and sales data to calculate the precise amount a salesperson should offer for the vehicle. Ryan, whose previous work includes jobs in private equity, teaching and with the City of Chicago's Police Department, says he is energized by the opportunity being his own boss affords. Though much research and a careful business plan preceded the launch of the venture, he says a willingness to remain flexible is an essential part of his business strategy. "Our five-year goals will look a lot like the goals we initially laid out, but our way of getting there will have changed quite a bit," Ryan says. To prepare students for the real-world challenges of entrepreneurship, Kellogg Professor Barry Merkin guides them through the major's capstone course, in which they create an idea for a viable business, author a business plan and present the final version to financiers, including commercial bankers, angel investors and venture capitalists. By all accounts, the class — Entrepreneurship and New Venture Formulation — is complicated, fast-paced, pressure-filled and entails a mountain of work. Merkin offers no sympathy or spoon-feeding to students who haven't learned what they need to complete their business plans, instead encouraging them to go out and find the information they need on their own, exactly as will be necessary in real life. His goal: to create an entrepreneurial experience that's as realistic as possible, without all the inherent risks. He says the process of presenting a business plan is pivotal for success, requiring preparation and rehearsal to avoid a life-altering failure. He recalls his own situation, before such courses were offered. After a year of nonstop research, he presented his first business plan again and again, but failed to raise the necessary capital to launch. "There is no question in my mind that the company would have been successful if I had presented it with the skill of today's Kellogg students," says Merkin, who went on to earn his entrepreneurial stripes running four companies. He considers it a success when a former student becomes a successful entrepreneur but, perhaps surprisingly, also when a pupil decides entrepreneurship isn't the right path. Merkin says he's seen the emotional and financial rewards that can come from a successful venture, but also the bankruptcies, ulcers, heart attacks and nervous breakdowns that sometimes result when someone who isn't suited for the field enters it. "Entrepreneurship is a fairly lonely place," Merkin says. "When you're a beginning entrepreneur, you lack money, you lack time, you lack information and sleep. It's an incredibly difficult thing and not a lot of people can do it." But for those driven to start their own businesses, Merkin sees little choice other than to heed the call. Successful entrepreneurs, he says, have a voice inside of them almost screaming, "I must create something." He says, "That need just takes over life. It's a need that, for the most part, can't be satisfied by a traditional role in a traditional company." Kellogg School professors and alums agree that while many people appreciate the freedom and the opportunity for wealth creation entrepreneurial ventures offer, those who eventually succeed are the few who are able to execute their ideas and can perform many roles within an organization well. Qualities commonly used to describe these entrepreneurs include "passionate," "persistent," "resilient," "tenacious" — even "neurotic." "The right person for running a company is somebody who doesn't mind rolling up her sleeves and doing anything that needs to be done," says Jill Gordon '80, who founded a chain of children's hair salons called Kidsnips in the Chicago suburbs with classmate Kim Stolze '80. "There's no one else to do the thinking and the planning and the scrubbing of the bathroom floors. I looked around and realized that someone was me." Along with the joys — the thrill of making their business concept work and the flexibility to spend time with their children — Gordon and Stolze must deal with the frustrations the business sometimes deals out. Gordon fields all the calls from customers who are unhappy with their experience. An effective partnership with Stolze helps to get her through the rough spots, she says. Rogers' advice to those who want to maximize their chances is fourfold: Use your time at Kellogg to gain a solid grounding in business fundamentals; take advantage of experiential learning opportunities, such as the school's internship program; develop a network of consultants and advisers who can help you refine your ideas; and, perhaps most importantly, save as much money as you can to finance it all. Rogers also advises students to continue to build their skills at established companies after graduation — whether the companies are entrepreneurial firms or Fortune 500 juggernauts — before venturing out on their own. "We are not focused on developing students to become entrepreneurs immediately after graduation," he adds. "We believe that entrepreneurship is a journey, not a 10-yard sprint." Eventually, though, all prospective entrepreneurs realize it is time to face their fears, putting their plans and market research to the test. David Weinstein TMP '00 says he drew on nearly everything he learned at the Kellogg School when founding two companies, the technology firm BlueMeteor, and later, David Weinstein & Associates LLC, a Chicago-based consulting firm. Despite successfully raising $30 million to launch BlueMeteor, Weinstein says he underestimated the importance of selling and wasn't quick enough to hire people with skills the firm desperately needed. "My passion got the company from Point A to Point B," he says. "What I was slow to realize was that I needed someone else to get it from Point B to Point C."
Now president of the Chicagoland Entrepreneurial Center, a Chamber of Commerce-affiliated organization striving to strengthen the growing base of small businesses in the region, Weinstein translates those experiences into advice for the city's new entrepreneurs, helping them raise capital and develop a rapport with potential clients. "It's difficult to tell an entrepreneur to do something. But because I've been there I can connect with them," he says. "Entrepreneurs relate to others who have taken similar risks and share the ability to be decisive." Despite the impression fostered by the Internet boom, the entrepreneurial spirit isn't limited to gutsy dot-com firms. Even large, established corporations need an infusion of new ideas to fuel growth and take calculated risks to keep up with changing markets and customer needs — an idea sometimes referred to as "intrapreneurship." This idea isn't new to Scott Smith '76, publisher of the Chicago Tribune, who says Tribune Co. embraces intrapreneurship by rewarding employees for their innovations and not penalizing them when ideas fail. He offers an illustration from his own career. As chief financial officer in the early 1990s, he got the company involved in a start-up newspaper in the United Kingdom that, for a combination of reasons, went under two years after its launch. The bottom line: the company lost $10 million. A few months later, Smith recommended the company put $5 million in a fledgling new media venture called America Online. His superiors OK'd the investment despite his earlier association with the failed newspaper — a move that turned out to be a huge boon to Tribune Co.
"My willingness to take another risk that could also have been a failure was supported by the environment in our company that says we're willing to take educated risks for significant opportunities," Smith says. "Having people who are resilient, and an organization that is supportive of that resiliency, is vital." More recently, the paper forged a plan to create a special edition geared to young adults and the advertisers who want to reach them, assembling a small team dedicated to the venture. Five months later, it introduced the Red Eye edition. Refinements, such as the addition of home delivery and an expanded entertainment section, continue today. "You cannot be afraid of competing with your established business, because if it's a good idea, someone else is going to do it eventually — and better you than the competitor. It's about opportunity-seeking where risks are inherent," Smith says. The key, agrees Smith and Dr. Charles Reich, executive vice president of 3M Corp.'s health care business, is taking smart risks. 3M CEO James McNerney is a member of the Kellogg School Dean's Advisory Board. The Minneapolis-based company spurs innovation with its Technical Forum, a company-wide organization to which each technical employee belongs. Special-interest chapters such as "adhesion" and "optical" cut across the firm of 70,000, with each employee selecting areas of membership based on individual interests. The sharing that takes place in these chapters, Reich says, allows employees to find new market applications for research, and has allowed the company to introduce hundreds of successful products — everything from stationary lines to dental supplies. "From very early on, this company has had a philosophy that you are better off with people making mistakes and learning from them than not trying at all. Management expects people to try new things and that's what we do. All we ask is that they take smart risks and, if they fail, to learn from the experience," Reich says. Heroes of the American economy? When all of the data is factored in, entrepreneurs might be the unsung heroes of the economy. Despite the job growth fueled by small businesses and start-ups during the last two decades, fewer than two in 10 Americans credit entrepreneurial companies for the growth, according to information from the National Commission on Entrepreneurship. When Steve Rogers speaks about the contributions entrepreneurs make to society, he barely contains his emotion, revealing a deep respect and passion for those with the courage to start independent ventures, as well as his passion for helping novice entrepreneurs succeed. Entrepreneurs, he says, are the heroes and "she-roes" of the American economy — people who create jobs for themselves and others. And the greater their chances of success, the more they are able to take others along with them on the journey. "People who have jobs pay taxes," he says. "People who have jobs tend to own their homes. And people who own their own homes tend to build healthier communities. All these things are interrelated."